Roll up! Roll up! It’s the Wayzgoose Print Fair back to confuse you with its peculiar name and impress you with its fabulous array of printed loveliness. Come along for a wonderful day of chatting about print, watching printmaking demos, and taking part in our tombola – you could win a printmaking course, or a strange can of food! Joint hosted by Medway Fine Printmakers and Hazelnut Press we’ll have stalls brimming with beautiful wares hand-printed in Medway, including cards, gifts, framed and unframed fine art prints from £10 and printed textiles such as bags, cushions and clothing. Throughout the day we’ll be running demonstrations of printmaking methods including letterpress, etching, Gelli printing and Print Gocco. A ‘Wayzgoose‘ is a traditional printers’ fair, a chance to swap and sell small amounts of equipment, type, and tools alongside printed artworks. Some of our sellers will have printmaking equipment for sale. Tags: Christmas fair, print fair, Printmaking, wayzgoose. Bookmark the permalink. 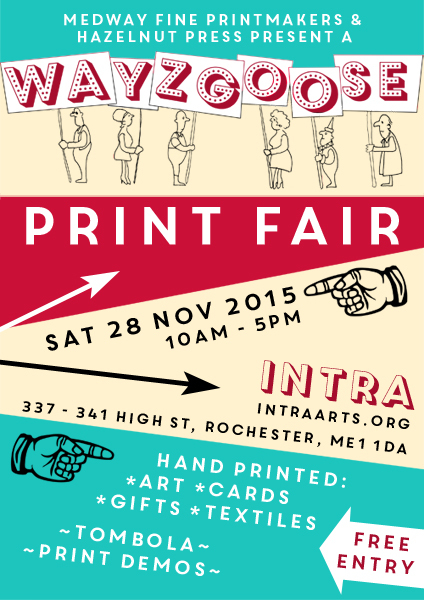 I intend attending your print fair on the 28th November do I just turn up or do I need a ticket ? That’s good to hear. You can just turn up, it’s a free event and you don’t need a ticket.